For the people of Indonesia, Morinda citrifolia, commonly known as 'Noni Fruit' or 'Fruit Pace', is not something foreign. He is known for generations as a remedy for various diseases, including: relief of pain, heal wounds, indigestion, high blood pressure, increase appetite, menstrual problems, and others. If it happened in your home environment much noni tree, why not try to consume fresh noni fruit? Here are some healthy recipes with Noni fruit that you can try. Young noni juice made ​​by blended with boiled water to taste. For a flavor enhancer, can be spiked with a little honey. Taken 30 minutes before breakfast. Efficacious for cleaning sediment 'blood fat', so as to cure atherosclerosis and stroke, and prevent a heart attack can limit the absorption of fat, consumption and the formation of fat in the body, so it can help slimming program. Moreover, it can reduce high blood pressure and relieve the mind of tension and stress, anxiety and discomfort. Ripe noni fruit is mashed, mixed with grated lempuyang rhizome, and a few tablespoons of boiled water. Squeeze and then drunk. Efficacious for the treatment of jaundice due to liver inflammation, kidney inflammation, and inflammation of the spleen due to malaria attack of bile and helps remove excess cholesterol. Cure urinary tract inflammation. 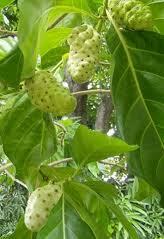 Ripe Noni fruit that have been mashed mixed with grated galangal rhizome, and a few tablespoons of hot water. Squeeze, then drink. For a flavor enhancer, can be spiked with honey or sugar cubes. Efficacious to reduce the fever with the flu and colds, especially in children, treat sore throats and tonsillitis. Noni Fruit only help reduce or alleviate the above diseases and eliminate the disease rather than guarantees. This is kerana no scientific study and above all the disease that diiktiraf by royal Malaysia or anywhere in the world body. Keep in mind, his impression depends on the follow-up reply to every individual and long body which he had faced his illness. So, for a chronic disease or long, it may take a long time.